"I’m part of a generation that wants to do something meaningful and create solutions to humanity’s grand challenges. For me, sustainability is the challenge of our lifetime!" As a Technology Strategy Consultant, I work on innovative digital projects for clients in multiple sectors. Since joining Accenture four years ago, following an internship, I’ve done a lot of digital strategy and innovation work. We support clients in understanding how new emerging technologies will impact their business and how they need to transform not only their business model but also their internal capabilities and operating models to adjust to the new digital landscape. In my work, I can see the power of technology in everything, from enabling a circular supply chain to setting the foundation for new digital business models. Accenture Strategy has been a great platform on which to build my knowledge of a subject I’m passionate about. Our teams include experts and thought leaders on sustainability and the circular economy, specifically on how technology can be an enabler for sustainability. My passion project is the Global Change Award; a partnership between Accenture, the non-profit H&M Foundation and the KTH Royal Institute of Technology. 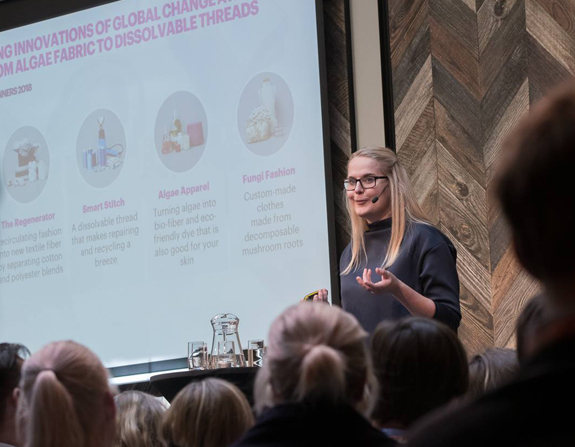 Each year, the Global Change Award has become more disruptive, with lots of innovation surrounding new materials and recycling methods to reduce waste in the fashion value chain. "I can see the power of technology in everything." Find the right role models and mentors who you can take bits and pieces from. You need people you can identify with. I’ve had some great role models, mentors and career counselors in Technology Strategy who have inspired me by the career paths they have followed. I also believe it’s important that we highlight strong women who have made a success of themselves in Accenture Strategy; Accenture has a truly inclusive environment, where we believe in the power of diversity.